Acute macular neuroretinopathy (AMN) is a rare disease, the etiology of which remains unclear. An ischemic event at the level of the deep capillary plexus has been proposed. The authors present three cases of AMN in the context of active systemic Behçet's disease, with the support of multimodal imaging. All patients were known to have Behçet's disease before the diagnosis of AMN. AMN was confirmed in all three cases on spectral domain optical coherence tomography (SD-OCT), near infrared reflectance and OCT angiography. Behçet's disease is known to be a prothrombotic disease. The presentation of AMN in this context supports the presumed ischemic etiology of AMN. Behçet's disease (BD) is a rare, multisystem, chronic disease. It is thought to be caused by a nonspecific activation of the innate immune system perpetuated by adaptive immune responses against environmental and auto-antigens, leading to a proinflammatory status.10 The most common ocular manifestation of BD is uveitis with associated retinal vasculitis. It has a preponderance for retinal veins rather than arteries, although the both may be affected in BD retinal vasculitis.11, 12 The aim of this report is to describe AMN-phenotype as a manifestation of active BD, supporting the ischemic etiology underlying AMN. All of the reported cases were classified as AMN Type 2 based on their SD-OCT appearance. A 30-year-old white female presented to the Ophthalmic Emergency Department with a 4-week history of paracentral scotoma affecting the right eye (OD). She had been diagnosed with BD 6 years previously. There was no past ocular history and no history of a preceding flu-like illness. Colchicine treatment for her BD had been stopped 1 month prior to presentation, as the patient had decided to start planning for pregnancy. A flare of her arthritis and cutaneous disease followed 3 weeks after withdrawal of colchicine. She was subsequently started on oral prednisolone and was taking 10 mg daily at the time of presentation. The best-recorded visual acuity (BRVA) was 20/20 in both eyes (OU). Anterior segment examination revealed 2+ cells OD according to Standardization of Uveitis Nomenclature grading.13 Fundus examination was unremarkable in both eyes. 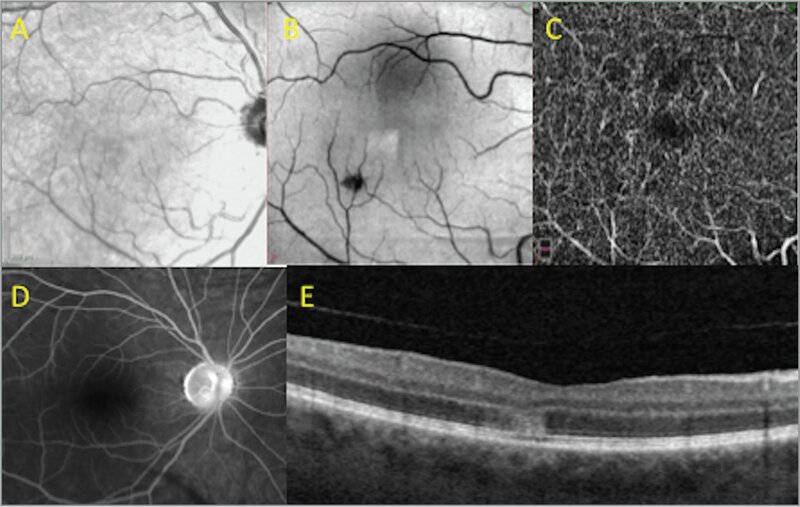 Multimodal imaging including SD-OCT, NIR, and OCT angiography (OCTA) (AngioVue; Optovue, Fremont, CA) supported a diagnosis of AMN (Figure 1). Right eye (OD) of patient 1 at presentation (superior row) showing a dark-grey petaloid lesion, the apex of which points toward the foveal center on near infrared reflectance (NIR) imaging (A), corresponding with a similarly shaped hyperreflective area on en face optical coherence tomography (OCT), 3 mm × 3 mm, segmented at the level of the outer retina (B). OCT angiography (OCTA), 3 mm × 3 mm, at the level of the deep capillary plexus (DCP) showed a slight irregular enlargement of the nasal foveal avascular zone and a subtle loss of capillary network nasally (C), and conventional OCT B-scan showed a focal area of disruption on the ellipsoid zone (EZ). 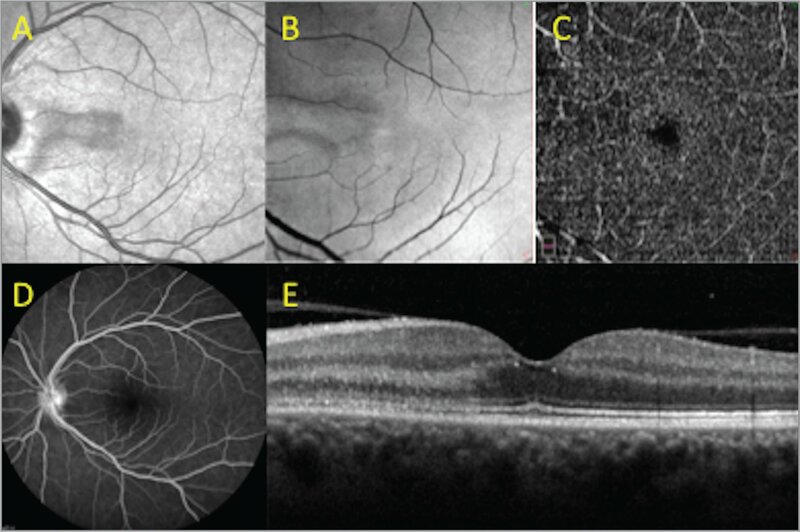 OD of patient 1 at the last follow-up, 18 months after presentation (inferior row), showing a partially resolved lesion on NIR imaging (A2), en face OCT (B2), OCTA (C2), and OCT B-scan with normal morphology of the outer retina (D2). The patient was started on hourly topical prednisone acetate 1% with subsequent tapering. Anterior chamber activity responded well to treatment. In the context of relapsing BD with symptoms suggestive of a flare-up of her systemic inflammation and visual symptoms associated with a presumed underlying ischemic etiology, the decision was made to increase oral prednisolone with gradual taper (commencing on a dose of 1 mg/kg) and to start azathioprine 150 mg (Azasan; Salix Pharmaceuticals, Bridgewater, NJ) daily. At the time of her most recent visit, 18 months after initial presentation, her visual symptoms had improved except for a smaller, but persistent, scotoma (Figure 1). A 48-year-old man presented to clinic with a 2-week history of left eye (OS) central blurred vision and floaters. The patient had a past medical history of BD but was not on treatment. He reported oral and genital ulceration and arthralgia for the previous few weeks. Past ocular history was unremarkable and BRVA was 20/20 in each eye. There was no anterior chamber activity and only mild vitreous haze of 0.5+ in the OS. Fundus examination was unremarkable in OU, but NIR and SD-OCT confirmed the diagnosis of AMN (Figure 2). FFA in the OS showed mild optic nerve leakage. On this occasion, the patient was treated conservatively. Left eye (OS) of patient 2 at presentation showing a typical hypointense lesion pointing toward the fovea on near infrared reflectance (NIR) (A). En face optical coherence tomography (OCT) segmented at the level of the outer retina showed a hyperreflective paracentral lesion corresponding with NIR findings (B). OCT angiography, 6 mm × 6 mm, at the level of the deep capillary plexus showed a focal loss of capillary network nasal to the avascular foveal center (C). Fundus fluorescein angiography (FFA) showed only mild left disc hyperfluorescence (D). Spectral-domain OCT showed an hyperreflective area at the level of the outer plexiform layer, outer nuclear layer, and ellipsoid zone with preserved retinal pigment epithelium (E). He described a persistent left central scotoma 1 month later, but this had subjectively improved since presentation. A 52-year-old man presented acutely with an upper left quadrant blind spot OD. He had a past ocular history of bilateral panuveitis and retinal vasculitis, previously controlled on adalimumab (Humira; AbbVie, North Chicago, IL), which was withdrawn 6 months before presentation due to inactive disease. The patient was diagnosed with BD after developing a skin rash and painful mouth ulcers 4 months after cessation of adalimumab. He was taking 5 mg oral prednisolone daily at the time of presentation. BRVA was 20/20 bilaterally. Anterior segment examination demonstrated 0.5+ cells OS. Vitreous haze score was 0.5+ and fundal examination showed a small cotton-wool spot inferotemporal to the fovea in the OD. NIR revealed a very subtle hyporeflective area corresponding to EZ and ONL disruption adjacent to the cotton-wool spot on the SD-OCT that was compatible with a diagnosis of AMN. FFA was unremarkable with no signs of active vasculitis (Figure 3). Right eye of patient 3 at presentation. Near infrared reflectance imaging showed a very subtle hyperreflective area inferonasal to the fovea (A). En face optical coherence tomography (OCT), 6 mm × 6 mm, segmented at the level of the outer retina showed a corresponding hyperreflective lesion with the apex pointing toward the central fovea and a hyporeflective, smaller, round lesion that represented the masking effect of a cotton-wool spot (B). OCT angiography, 3 mm × 3 mm, at the level of the deep capillary plexus, revealed a subtle area of hypoperfusion inferotemporally (C). Fundus fluorescein angiography was unremarkable (D). OCT B-scan revealed a small area of thickening and hyperreflectivity of the outer plexiform layer, outer nuclear layer, and ellipsoid zone (E). The patient was started on intravenous methylprednisolone (1 g/day for 3 consecutive days) with a subsequent oral prednisolone tapering dose (starting on a dose of 1 mg/kg). Adalimumab was restarted. He described a satisfactory symptomatic response to this treatment, with resolution of the scotoma. The prothrombotic component of Behçet's-related vasculitis has mainly been attributed to endothelial damage and dysfunction of the vessels, rather than hypercoagulability.16 However, a generalized hypercoagulable state is known to be present. This significant thrombotic tendency can lead to ischemic events at the level of the DCP and would be consistent with the presumed vascular pathogenesis in AMN. This hypothesis is supported by the OCTA findings of a decrease in capillary network density at the level of the DCP in the areas corresponding to abnormalities on other imaging modalities. Each patient reported systemic symptoms of BD, notably joint and skin manifestations, at the time they developed visual symptoms. The presence of AMN in this context may therefore represent a form of active ocular vascular inflammatory disease. The development of AMN in the context of BD may warrant escalation of immunomodulatory treatment in these patients. Accordingly, AMN should be included as a differential in patients with BD who present with blurred vision or scotoma, even in the absence of typical signs of vasculitis on FFA. Equally, the presence of AMN should prompt the ophthalmologist to carry out a careful review of systems to exclude any systemic symptoms suggestive of BD. The role of corticosteroids in the treatment of AMN in the context of BD is unclear. Although the effect of treatment of vascular occlusions in BD has not been specifically investigated, there is strong evidence to support the use of immunomodulatory treatment in BD to decrease the rate of vascular-occlusive events.22,23 Given the potentially devastating visual consequences of repeated ocular inflammatory events, there is a strong argument for the use of systemic steroids in this situation. The presence of a clinical phenotype of AMN in patients with BD, supported by the findings on OCTA, suggests an ischemic event at the level of DCP as the underlying cause of AMN. From University Hospital Fundacion Jimenez Diaz, Madrid (IH); Bristol Eye Hospital, University Hospitals Bristol NHS Foundation Trust, Bristol, UK (SH, CMG, EC); and Moorfields Eye Hospital NHS Foundation Trust, London, UK (TRB). Dr. Guly has received personal fees from Abbvie outside the submitted work. Dr. Carreño receives personal and other fees as speaker and a consultant for Abbvie and receives other fees as a consultant for Santen outside the submitted work. The remaining authors report no relevant financial disclosures. Address correspondence to Ester Carreño, MD, PhD, OphthalmologyDepartment, University Hospital Fundacion Jimenez Diaz, Av Reyes Catolicos, 2, 28040 Madrid, Spain; email: carregnito@gmail.com.